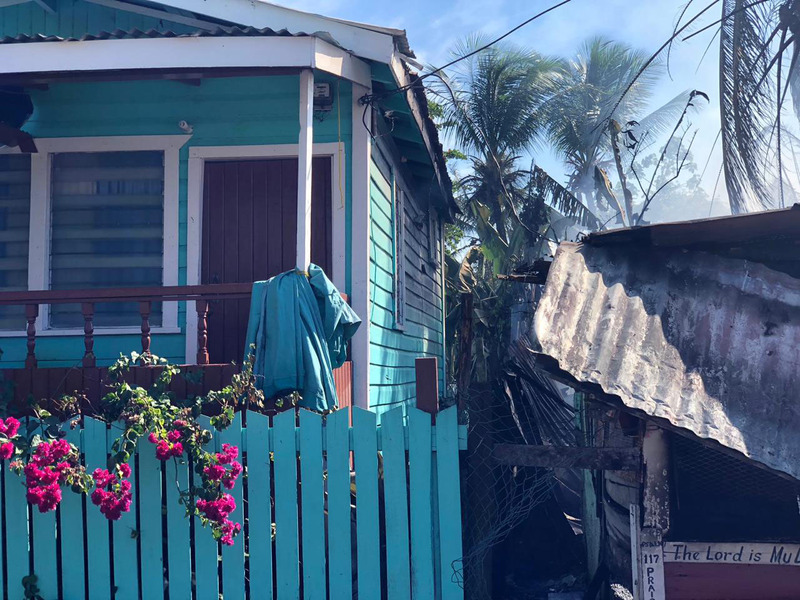 The charred remains of a woman were pulled from the debris of her Freeman Street, East La Penitence home yesterday after a fire of unknown origin. It is suspected that Arlene Moses, 46, died in the blaze. 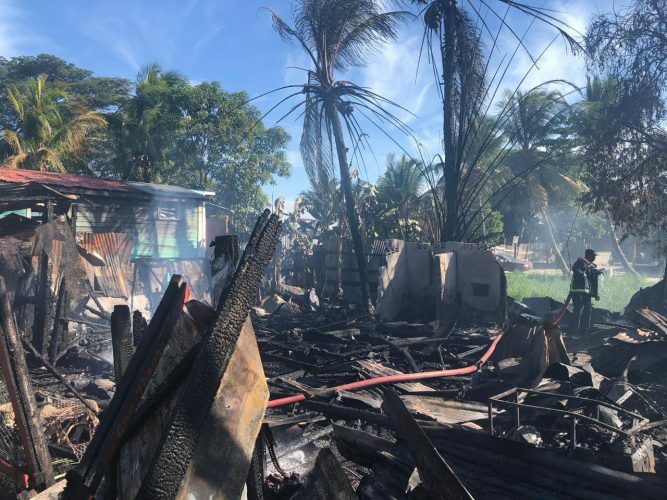 After some uncertainty as to whether the woman was at home at the time of the fire, her remains were eventually found hours after in the smouldering debris where her bedroom was once situated. 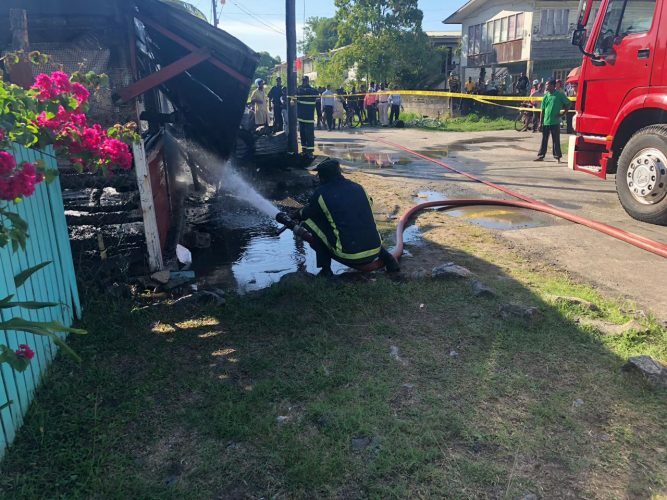 Residents told Stabroek News that they saw thick smoke rising from the house. “We went out on the road [Mandela Avenue] and we see the smoke after 1 [pm] and I run around because I hear she [Moses] in the house. And is was just like 10 of us come, so I decide to pick up a big brick and pelt the window at the side and just like that the fire buss out and come out and I run back over the road because we couldn’t stand the heat,” one of the residents who responded first explained. 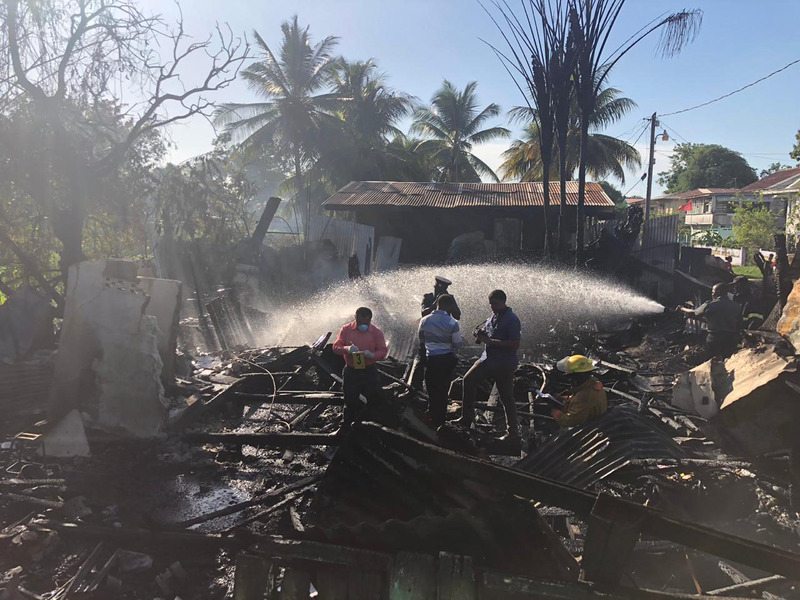 However, about 20 minutes after they arrived at the scene, two Guyana Fire Service (GFS) tenders reached and quickly got to work. By that time, most of the house was already crumbling. As a result, the firefighters concentrated their efforts on containing the fire and preventing it from spreading to the two houses on the east and west. 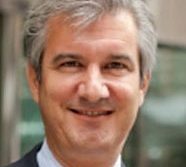 “Apparently like nobody call them [GFS] first, so when they reach the house was already in big, big fire and so they had to concentrate on the other two houses. Even though they come late, I must congratulate them because they come with water and as soon they reach they went to work and you could see for yourself them two houses only get lil’ burn marks and they right next to the fire,” the man added. After the GFS was able to contain and put out the fire, the search for the woman’s body went on with uncertainty as there were conflicting reports over whether the woman was in the house at the time of the fire. However, her nephew, Dillon Moore, who has been living with her for the past six months, confirmed that when he left the house yesterday morning for work, Moses was present. “Last night me and she went gyaffing and this morning I left her in her room. She was supposed to go to the hospital today, so I left her and went to work. She’s diabetic and would normally have to go to the hospital to get her foot clean and she was supposed to go this morning,” Moore explained, while pointing out that Moses had one of her legs amputated years ago and would use crutches to move around. He said that he was at work when he received a call from one of his cousins indicating that house was on fire. After a thorough search by the GFS that went on for more than two hours, the woman’s charred body was found under debris in her bedroom. Moore said that the house was well furnished and along with his aunt’s belongings, furniture and other household items he also had items and important documents that were destroyed. “I have to study now where I gone stay now, too… I had stuff in the house—freezer, TV, microwave—plus my grandfather had tools and mechanical parts,” Moore said, while stating that collectively they lost millions of dollars. Up to press time, the GFS had yet to ascertain the origin of the fire and residents claimed that they did not observe anything suspicious nor did they experience any electrical issues prior to the fire.